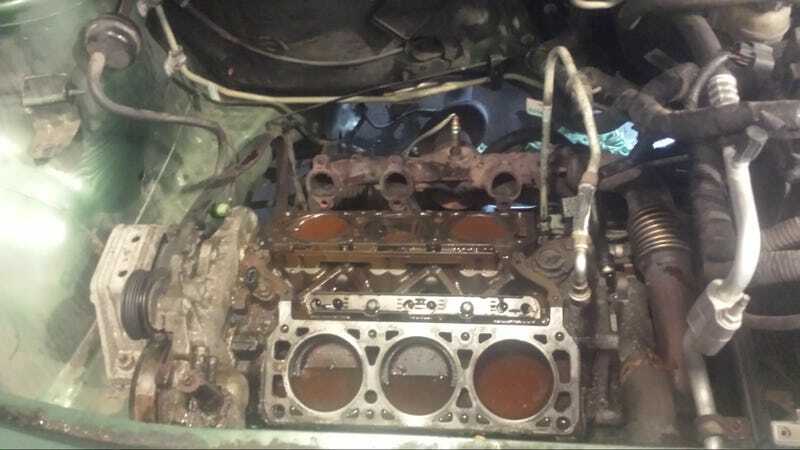 A few months back my GFs SUV got diagnosed with a blown head gasket. It had suffered a pretty significant overheat and the shop quoted her to replace the engine. We quickly worked out a new replacement vehicle, but in the meantime she had a dead Equinox with no resale value. And let’s be honest, you don’t replace an entire engine for a blown head gasket and a single overheat. The bottom end is fine! I was nervous about taking on the fix as I hadn’t done a major overhaul on a DD engine in several years, but it is worth almost nothing in non running condition. So, over the last month and a half I used any spare time not committed to the racecar to disassembling and repairing her former DD. Today was the moment of truth. I turned it over for the first time in two months and it fired almost immediately! It did spring a quick fuel leak, but a run to the auto parts store for a couple new o-rings and all is well. It is always a bit nerve wracking to tear into a new-to-me vehicle for any sort of maintenance let alone a major engine overhaul. You’re never sure what sticking points or trouble spots you’ll find a long the way. The disaseembly went reasonably well. Being a V6 the back half of the ignition system and exhaust was a bit hard to reach but nothing was seized too badly and it only took a wrench and some strength to get the toughest bolts loose. Once all the parts arrived it went back together fairly smoothly too. I hadn’t forgotten where all the bolts went. And there weren’t any left over. The heads went on pretty easy, the new seals were straight forward (the intake seals the top of the cam, and heads with four separate seals), I only had to redo a few lines that I assembled in the wrong order, and fortunately I found all the torque specs online. It feels pretty awesome to hear the thing run again and really rewarding to take something destined for the scrap heap and make it new again. It also helps the confidence to be able to wrench on an unknown vehicle and get it right the first time thru.